In response to The Japan Times article, “Confusion reigns in U.S. 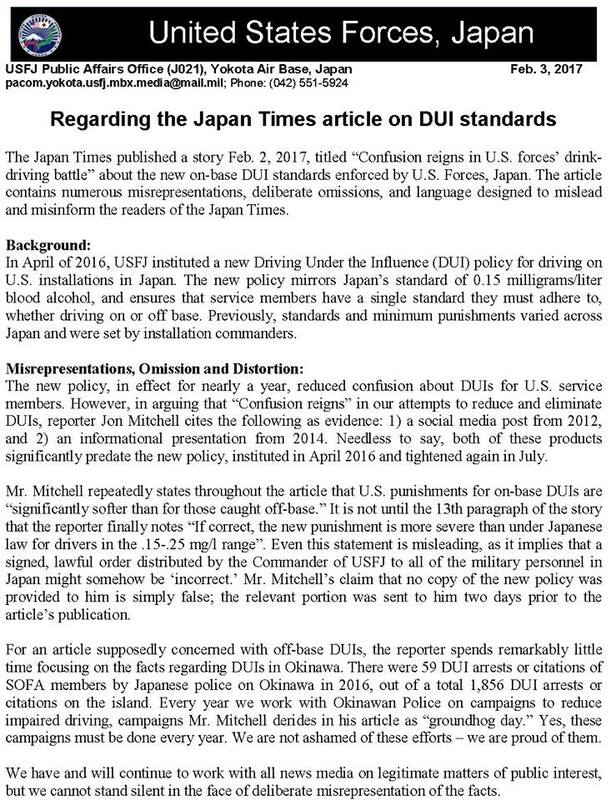 Forces Japan’s battle against drunken driving” (1st February 2017), USFJ posted to its Facebook page a statement titled “Regarding the Japan Times article on DUI standards” (3rd February 2017). ​To research the article, between 3rd January and 1st February 2017, I exchanged 22 emails with Deputy Director, Public Affairs USFJ, Major John Severns, to provide him with the opportunity to clarify the details raised in the upcoming story. In the USFJ rebuttal, the author implies I was provided with a copy of a “signed, lawful order distributed by the Commander of USFJ.” On 31 January, I asked Severns to provide me with a full copy of the relevant document but he declined, opting to send a partial screenshot - the context of which was unclear and impossible to verify. For decades, USFJ has been allowing service members to drive within its bases at a level of intoxication considered a crime on the other side of the fence. Following off-base incidents in which local nationals were injured or killed by drunk-driving SOFA personnel, USFJ repeatedly pledged to do more to reduce such accidents - all the while allowing these BAC double-standards to persist.